Nick D’Aloisio was studying for his History exam when he saw the need to summarize large amount of textual contents into smaller summary for quicker reading. 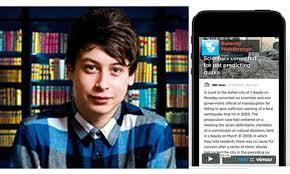 In March 2011 when he was only 15 years old he developed the iPhone app Trimit to address this need. Trimit condensed long texts into 500 and 1000 characters summary. Trimit was featured by Apple as one of the noteworthy apps of 2011 which drew the attention of Hong Kong based billionaire Li Ka-shing who invested $300,000 in venture capital funding. Nick used the feedback from Trimit to completely redesign the app and re-launched the app in December 2011 as Summly. Summly summarized web pages into a few key points and keywords allowing the user to read the gist of the article without going through the whole article. Summly was a huge success and received a series of investment from a number of high profile international celebrities such as Ashton Kutcher, Stephen Fry and Yoko Ono. On March 2013, about two years after the app was first launched Yahoo announced to buy the app for reportedly $30 million in cash and stocks. Yahoo also gave Nick a job at the Yahoo London office. This is a remarkable story and it’s worth investigating how an app build by a 15 years old can draw so much traction from investors and eventually led to be acquired by a top seed company like Yahoo. I think aspiring entrepreneurs can learn a lot from this story. I have outlined five things that helped Nick and Summly to succeed. 3. He got the attention of Apple which provided free marketing for his app. Apple promoting Trimit as one of the noteworthy apps of 2012 was a turning point as it drew the attention of La Ka-shing who saw the potential of the app. He then invested $300K on the app which allowed Nick to quickly come up with a newer and better version of the app before anybody else did. He also got a lot of valuable guidance from the La Ka-shing which helped him stay on track. 4. He go the media attention. The news of a Hong Kong billionaire investing thousands of dollars on a 15 year old’s app lead to a lot of free marketing in the media. Everybody knows that media loves to promote these stories. This helped Nick get a lot of users for Summly because everyone wanted to find out what this fuss was all about. Now given that the number of users of the app was growing and that Nick already had a backing of a renowned investor such as La Ka-shing led to more investment from other celebrities such as Stephen Fry and Ashton Kutcher. This resulted in a domino effect which caused more hype in the media and resulted in more users being interested in the app. 5. Nick formed the right partnerships. Nick and his team partnered with SRI International to improve the quality of the app. They saw the fit and they acted upon it. SRI International, with the help of Summly team, built the summarization technology that took Summly to the next level. This eventually caught the attention of Yahoo who was trying to revamp their mobile offerings and decided to acquire the app.